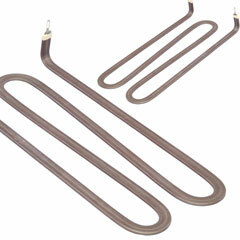 FIREBAR® clamp-on heating elements provide added heating performance over standard round tubular heating elements—especially for immersion applications in petroleum based liquids that require high kilowatts. The FIREBAR clamp-on heater's unique flat surface geometry packs more power in shorter elements and assemblies, along with a host of other performance improvements. FIREBAR elements are available in single- and double-ended constructions with one inch or 5⁄8 inch heights. These two configuration variables make it possible to use FIREBAR clamp-on heater elements instead of round tubular elements in virtually all applications.